Active Pixel Sensor (APS) is an image sensor, made up of an array of pixel sensors. In these pixel sensors, each pixel sensor consists of a photo detector and an amplifier. Out of these APS, the most notable is the CMOS Active Pixel Sensor (CMOS APS). CMOS APS has great applications in cameras and also DSLRs. It is called so as it is manufactured by the CMOS process. This type of image sensor is very similar to that of a Charge Coupled Device (CCD). They are also called active pixel sensor imager and also active pixel image sensor. The CMOS APS uses a photo detector to detect the light and converts it into electrical signal. This signal is then amplified using several transistors and is then moved using traditional wires. The wide use of CMOS Active Pixel Sensors began during the year 1993. The Jet Propulsion Laboratory developed some prototypes which were later commercialized. After knowing its immense potential in the field high speed, low power motion capture cameras many companies quickly adopted and developed this technology. During the early 1960’s, before the discovery of active pixel sensors, there were only passive pixel sensors. In this mechanism, the pixels were designed in a 2D structure, with access enable wire shared by pixels in the same row, and output wire shared by column. Each pixel did not have an amplifier and so an amplifier was connected ar the end of each column. High power consumption, greater noise and also slow output were some of its disadvantages. 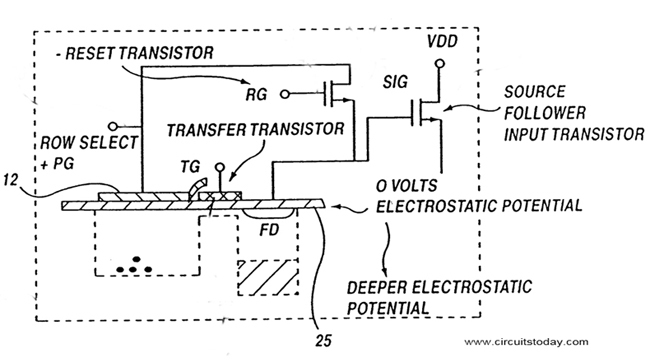 In 1969, the active pixel sensor was first introduced by adding independent amplifiers for each pixel. Thus in 1970, the Charge Coupled Device was invented. Thus they were very useful in the working of cameras. During the early 1990’s the CMOS process was well developed and was considered to be the base for all types of logic devices as well as microprocessors. This further led to the invention of CMOS APS. The pixel of a CMOS APS mainly consists of photo detectors like a JFET photogate or pinned photodiode. The whole pixel will be called a 4T (4 transistor) cell. The 4T cell mainly consists of a transfer gate, reset gate, selection gate and also a source follower input transistor connected to the photo detector. The photo detectors used in this 4T cell were first used for Charge Coupled Devices. But, when it was further connected it to the transfer gate and other components the charge transfer was done at a greater speed and also low noise was generated. There are 3 transistor (3T) cells used now as well. As they are very simple in fabrication they are more commercially produced. APS has applications in the field of X-ray as well. For taking digital X-rays, thin film transistors (TFT) is also used. But, its larger size and low gain makes the number of TFTs limited. A 2-D array of pixels is organized into rows and columns. The reset lines are connected to the rows so that when RESET occurs the whole row gets reset. Similar is the case of the select lines. The outputs of each pixel in any given column are tied together. Take a look at the architectural diagram given below. The applications of CMOS APS includes web cameras, motion capture cameras, digital radiography, endoscopy cameras and also X-ray imaging. They are mainly known for their application in filmless cameras.